One of my favorite books from the past few years is Austin Kleon’s, Steal Like an Artist. I’ve mentioned it in several previous posts (search “Austin Kleon” on the site and you’ll find them), mostly because I continue to pop back to it on a regular basis. It’s filled with plain, simple, good thoughts to inspire your creative side. I also follow Austin on Twitter. Awhile back, he declared that he was going to shift from immediately tweeting out lots of ideas, project updates, and interesting things he came across online to putting them all in an indexed version that he’d send out via his Tumblr account on Fridays. Of course, as soon as I saw this announcement I signed up for his email list and ever since, his Friday email to me has become something that I look forward to. My new role as an evaluator finds me doing a lot of things that I’m hard pressed to chronicle as I once did for my work in the library world. In part, I think it’s because I spend a great deal of time learning new things and/or putting newly learned skills into action. It takes time and energy that ultimately takes away from my abilities to come up with interesting musings for this blog. That said, I’m not about to give up my blogging habit. It means too much to me. After lots of thinking about how to revitalize it, the thought came to me to take Austin’s advice and steal an idea … from him! Thus, I’ve decided to shift the pattern of own blog a bit – at least for awhile – and turn it into a way to share with you, my readers and followers, some of the cool and interesting and inspiring and, dare I hope, helpful things that I come across weekly in my work and play. So here we go … here are a few things from the past several weeks (I’m cheating already, but it’s the start of a new thing and thus allowed). Enjoy! It only seems fair that I give a tip of the hat to Mr. Kleon to start. Besides his books, I also enjoyed watching the video from a terrific talk that he gave to an audience at Google a few years ago. It’s a wonderful summary of his theory on stealing and some inspiring words to anyone seeking to get out of the way of themselves when it comes to creativity. Juice Analytics is a data analysis and design firm in Atlanta that provides visualization services to businesses and organizations. They also freely offer a number of great resources for learning these skills, including white papers, video tutorials, and the book, Data Fluency (not free, but well worth the $21.59 price tag for my Kindle version). One of the best resources on their freebie page is “30 Days to Data Storytelling,” a guide to … well, it’s pretty self-explanatory, isn’t it? It’s a list of videos, tutorials, articles, etc., a few a day for 30 days, to help you understand how to use data to tell your story. Good stuff. Back at the end of the summer, just as school was ready to gear up, Slate published a series of blog posts during one week under the banner, What Classes Should I Take? The list is fascinating and the posts very well written. Two that I liked in particular were, The Secret Technique for Learning How to Code: Step 1. Don’t Be Intimidated, by Victoria Fine, and What are the Odds: To Learn to Think Critically, Take a Statistics Class, by Laura Miller. These two are most relevant to anyone in the library, information, or evaluation worlds. I also found the advice to take Art History, Public Speaking, and No Class at All, quite valuable. The entire series was great. The Noun Project – Icons for Everything – is pure awesomeness. A gazillion free icons to drop and drag and plop into place OR inspire you to make your own. One thing that I do often in my job is doodle pictures to tell the story of a particular group of researchers or a research center. Fancy word, infographics. Since I started sharing some of these on this blog and other places, several colleagues and friends have asked for advice on tools to use to make them. I tend to draw my own in Illustrator and/or Powerpoint, but there’s a handy list of 10 Free Tools for Creating Infographics on the Creative Blog website. 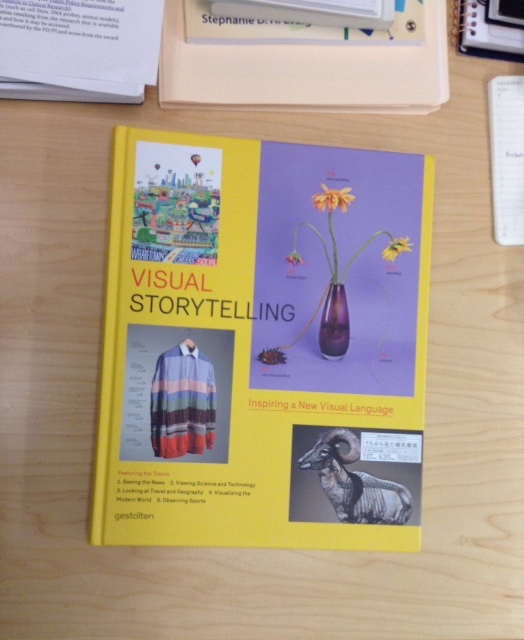 Visual Storytelling: Inspiring a New Visual Language, edited by Klanten, Ehmann, & Schulze, and available through Gestalten. I learned about this book after stumbling upon an interview with Jonathan Corum, the graphics editor for science at the New York Times. He’s one of many featured in this book and I can’t wait to dive into it. Now. Lunchtime reading!